Looking for a wireless activity and sleep tracker watch that will help you track your vital signs any time any place? 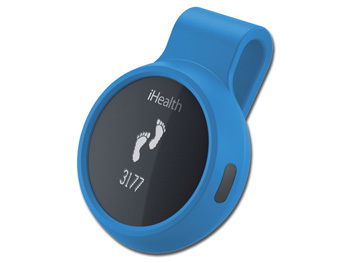 With the iHealth body activity tracker it will become very easy to monitor your health. With iHealth body activity tracker you will be able to track the steps that were taken, the distance travelled, the calories burned and also to know your activity level. With the unique iHealth wireless activity and sleep tracker you will also be able to track the hours you slept, the awaken times, your sleep efficiency and you'll be able to enjoy the silent alarm feature. All data that will accumulate in your body activity tracker can be synchronised to your mobile device or tablet. The free iHealth My Vitals App will help you to set trends, view statistics and will encourage you to set new fitness goals. This innovative wireless activity and sleep tracker device can be worn either as a watch ( wrist band) or as a belt-clip. The iHealth activity tracker watch is a sweat and rain proof, connects wirelessly via Bluetooth 4.0 technology. Battery: 1X3.7 V Li-Ion 165 mAh- 3 years life.